California NORML has recently released a great summary on the language contained in The Adult Use of Marijuana Act (AUMA). This is an initiative for legalizing cannabis for adult use (aka recreational). It is being backed by Sean Parker who is the founder of Napster and co-founder of Facebook. 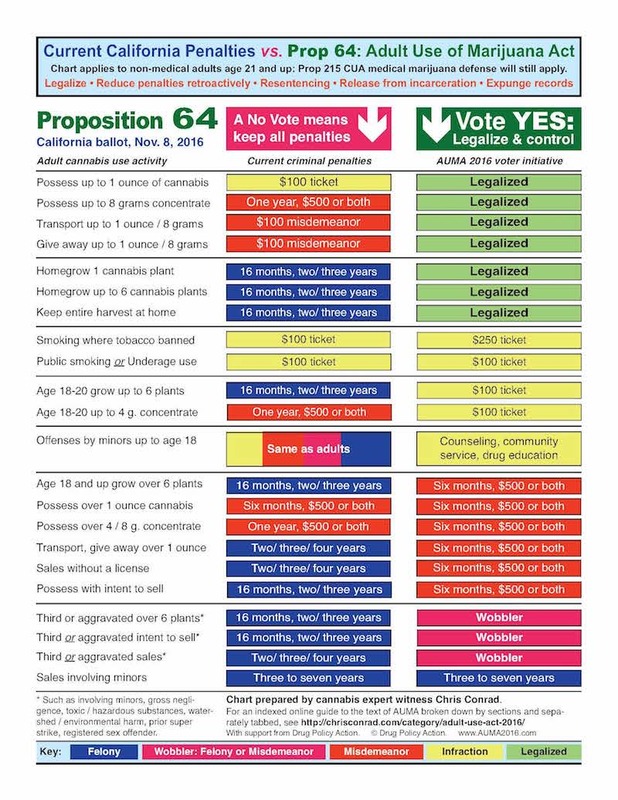 Please read below the information provided by California NORML and let us know what you think in the comments section! The Adult Use of Marijuana Act is a legalization initiative that will be circulated for the November, 2016 California ballot. AUMA is sponsored by internet entrepreneur Sean Parker with support from some other wealthy benefactors and drug reform advocates. AUMA is a lengthy, 62-page initiative which elaborately writes hundreds of detailed restrictions and regulations into state law. Its basic thrust is to (1) allow adults 21 years and older to possess up to one ounce of marijuana and cultivate up to six plants for personal use; (2) regulate and tax the production, manufacture, and sale of marijuana for adult use; and (3) rewrite criminal penalties so as to reduce the most common marijuana felonies to misdemeanors and allow prior offenders to petition for reduced charges. AUMA’s regulatory provisions are largely patterned on the Medical Marijuana Regulation and Safety Act (MMRSA), recently passed by the legislature and effective Jan 1, 2016; licenses for medical and adult-use would be distinct. *** Given its extraordinary length and complexity, AUMA contains a number of legal glitches and inconsistencies that will have to be fixed by the courts. It also contains a number of complications and restrictions that users accustomed to the looser framework of Prop 215 may find objectionable. AUMA fails to afford the same degree of protection to marijuana consumers as some other initiatives that have been filed with the state but are unlikely to qualify for the ballot. Cal NORML has not taken a position on AUMA, but is offering this guide to help our members and the public better understand its implications. PERSONAL USE: AUMA would make it lawful under both state and local law for adults over 21 to possess, process, transport, obtain, or give away to other adults no more than one ounce (28.5 grams) of marijuana (AUMA Sec. 11362.1). *** The initiative sets inconsistent limits for marijuana concentrates, allowing possession of up to 8 grams in Sec. 11362.1 (a)2 , but no more than 4 grams in Sec. 11357(a), (b) and (c) and 11360. *** Other provisions (VC 23222(b) and HSC 11360(b)) inconsistently prohibit driving while in possession of marijuana or giving away marijuana, in contradiction to 11362.1. These contradictions will have to be settled by the courts. CULTIVATION: Adults could cultivate up to six plants and possess the marijuana from these plants at their residence for personal use (Sec. 11362.1(3)). No more than six plants per residence. (N.B: this differs from the new limit for medical users under MMRSA, which allows 100 square feet of growing space per patient). All plants and harvested marijuana in excess of one ounce must be (1) kept with the person’s private residence or on its grounds, (2) in a locked apace, and (3) not visible from a public place. (11362.2). Cities and counties may regulate and prohibit cultivation outdoors, but cannot completely prohibit cultivation inside a private residence or accessory structure that is “fully enclosed and secure.” (11362.2(b)). PARAPHERNALIA: Marijuana accessories would be legal for adult use and manufacture. 11362.1 (a) 5. CONSUMPTION: The initiative makes it lawful to smoke or ingest marijuana, but forbids consumption in any “public place” except for licensed dispensaries when authorized by local governments. Public place” is commonly construed broadly to include any business or property that is open to the public. *** This will greatly reduce the locations where medical patients can inhale their medicine, as they can presently consume legally in streets and public areas where smoking is allowed. Also forbidden is consumption within 1,000 feet of a school or youth center while children are present, except on residential property or on licensed premises and provided the smoking is not detectable by the kids. (11362.3(a)3). VAPORIZERS RESTRICTED: Use of smokeless electronic cannabis vaporizers is prohibited except in tobacco smoking areas. *** This restriction ignores compelling evidence that cannabis vaporizers pose no public health hazard because they effectively eliminate harmful smoke toxins and carcinogens, as demonstrated in scientific studies by CA NORML. The initiative goes on to state that this section does not override laws regarding medical use, but no such laws currently protect patients’ right to vaporize or consume in non-smoking areas, so this point may be moot (11362.3(c)). The result will be to effectively preclude medical vaporization in housing and health facilities catering to patients. DRIVING***: Although the initiative states it is lawful for adults to transport marijuana (Sec 11362.1), it leaves standing a contrary existing law (VC 23222(b)) that makes it illegal to drive in possession of marijuana. Thus drivers would still be liable for arrest for transporting legally obtained marijuana in their car even if it was in a sealed container. A court ruling will be needed to resolve the evident conflict. SCHOOL GROUNDS: Possession or use on school grounds are banned while children are present. (11362.3a(5)). MANUFACTURE WITH VOLATILE SOLVENTS – Unlicensed manufacture of concentrates using volatile or poisonous solvents (not including CO2 or alcohol) are subject to heavy felony penalties (11362.4(a)6). EMPLOYMENT RIGHTS: The initiative does not interfere with the right of employers to discriminate against marijuana users, medical or otherwise, both on and off the job. ***11362.45(f). The initiative does not alter the protections of the Compassionate Use Act of 1996 (11362.45(i)). Physician recommendations must conform to minimal standards already established under MMRSA and current medical marijuana legislation (11362.712). ID CARDS: Qualified patients will need a state ID card if they want to be exempted from a 15% retail tax to be imposed on marijuana sales. (34011(g)). No card is needed to enjoy other legal protections of Prop. 215. The cost of the state patient ID card is limited to $100, or $50 for Medi-Cal patients; free of charge for indigent patients (11362.755). Identifying information in the ID card program is made subject to the Confidentiality of Medical Information Act (11362.713). CPS/CHILD CUSTODY: Qualified patients may not be denied child custody rights merely because of their status as medical marijuana users. 11362.45(f). OVERSIGHT: The Bureau of Medical Marijuana Regulation in the Department of Consumer Affairs is renamed the Bureau of Marijuana Control and given chief authority to regulate the industry. The Bureau/DCA is charged with licensing transport, distribution and sale; the Dept of Food and Agriculture is in charge of licensing cultivation; and the Dept of Public Health is in charge of licensing manufacturing and testing. (Sec 26010-12). The Governor is to appoint an independent, three-member Appeals Board to adjudicate appeals subject to standard procedures(26040). LARGE CULTIVATORS: A new category of Type 5 “Large” cultivation licenses is created for farms over ½ acre indoors or 1 acre outdoors. No Type 5 licenses to be issued before Jan 1, 2023. (26061(d)). MICROBUSINESSES: A new category of Type 12 microbusiness licenses is created for small retailers with farms not exceeding 10,000 sq. ft. ( 26067 (e) 2). LICENSE CONDITIONS: Licenses may be denied based on various factors, including restraints on competition or monopoly power, perpetuation of the illegal market, encouraging abuse or diversion, posing a risk of exposure to minors, environmental violations, and “excessive concentration” in any city or county. RESIDENCY: All licensees must be continuous California residents as of Jan 1, 2015. This restriction sunsets on Dec 31, 2019. PRIORITY TO EXISTING OPERATORS: Licensing priority shall be given to applicants who can demonstrate they have acted in compliance with the Compassionate Use Act since Sept 1, 2016. APPLICANTS WITH PRIOR CONVICTIONS: Licenses may be denied for convictions of offenses “substantially related” to the business, including serious and violent felonies, felonies involving fraud or deceit, felonies for employment of a minor in controlled substance offenses. A prior conviction for a controlled substance offense may not in itself be the sole grounds for rejecting a license. (26057). CS offenses subsequent to licensing are grounds for revocation. • Cultivators must comply with conditions set by Dept. of Fish and Wildlife and State Water Resources Control Board, plus all other state and local environmental laws. 26060, 26066. • The state shall establish an organic certification program and standards for recognizing regional appellations of origin. 26062-3. TRANSPORT and DELIVERY: The Bureau shall establish standards for types of vehicles and qualifications for drivers eligible to transport commercial marijuana (26070(b)). Local government may not prevent delivery of marijuana on public roads by licensees in compliance with the initiative and local law (27080(b)). NOTE***: this implies that local governments still retain the right to bar deliveries to medical marijuana patients under MMRSA! NON PROFITS: The Bureau is to investigate the feasibility of creating nonprofit license categories with reduced fees or taxes by Jan 1, 2018 (Sec.27070.5). In the meantime, local jurisdictions may issue temporary local licenses to nonprofits primarily providing marijuana to low income persons, provided they are registered with the California AG’s Registry of Charitable Trusts. *** This section is of no effect because marijuana non-profits are not allowed on the registry due to federal law. Nonetheless, there is nothing to prevent non-profits from registering as commercial entities under the act. ON-SITE CONSUMPTION: Local governments may permit on-site consumption at licensed retailers and microbusinesses provided: access is prohibited to persons under 21, consumption is not visible from any “public place” or non-age-restricted area, and sale or consumption of alcohol or tobacco aren’t allowed. *** This effectively ends the current practice of allowing beer and wine at popular cannabis events (26200(d)). POSSESSION FOR SALE (HSC 11359): Penalties are dropped from current mandatory felony to misdemeanor ($500 and/or 6 months). Felony enhancements allowed for repeat offenders, serious or violent priors, and sale to minors under 18. TRANSPORTATION, IMPORTATION, SALE OR GIFT (11360): Penalties are dropped from current mandatory felony to misdemeanors ($500 and/or 6 months). *** Felony enhancements allowed for importing, exporting, or transporting for sale more than 1 ounce of marijuana or 4 grams of concentrate. GIVING AWAY***: Section 11360(b) retains the current $100 infraction for giving away up to one ounce of marijuana. This conflicts with Section 11362.1, which makes it legal for adults over 21 to give away an ounce to other adults. This contradiction will have to be cleared up by the courts. The initiative enables legal production of industrial hemp under California’s existing hemp law, which has been in suspense pending approval by the state Attorney General.